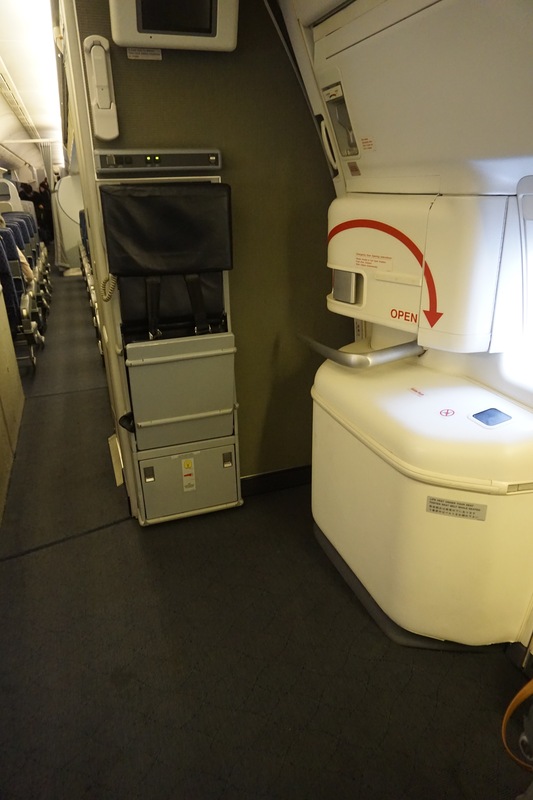 This report reviews the OLD American Airlines Economy product about their 777-200s. At post date, American Airlines is partway through refurbishing their 777-200 fleet. After such a short time in Madrid, it was time to head home. With lounge time in mind, I headed to MAD a bit early. I hopped off the Metro at the Terminal 4 station and headed for the check-in desks in Terminal 4. American Airline’s check-in desks are near the very end of the check-in aisles and occupy two different aisles. 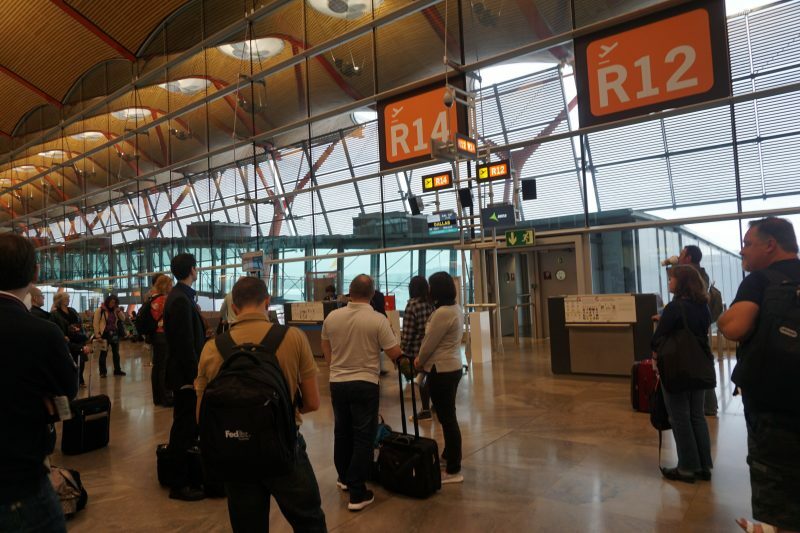 Keep in mind that Main Cabin and Priority/Business Class check-in are two different aisles so be on the lookout. Madrid’s airport staff is very chatty and for a very specific region. They’re on the lookout for suspicious behavior through casual conversation. I will say though, that the airport agents at MAD were the friendliest American Airlines employees I encountered all day! Pro Tip: If it’s your first time departing from Madrid, I recommend give yourself plenty of extra time. I took the Metro from Cuzco station which took about 45 minutes to Terminal 4. Add in security time, immigration, the train to Terminal 4S, and the maze of escalators at MAD, it all adds up. 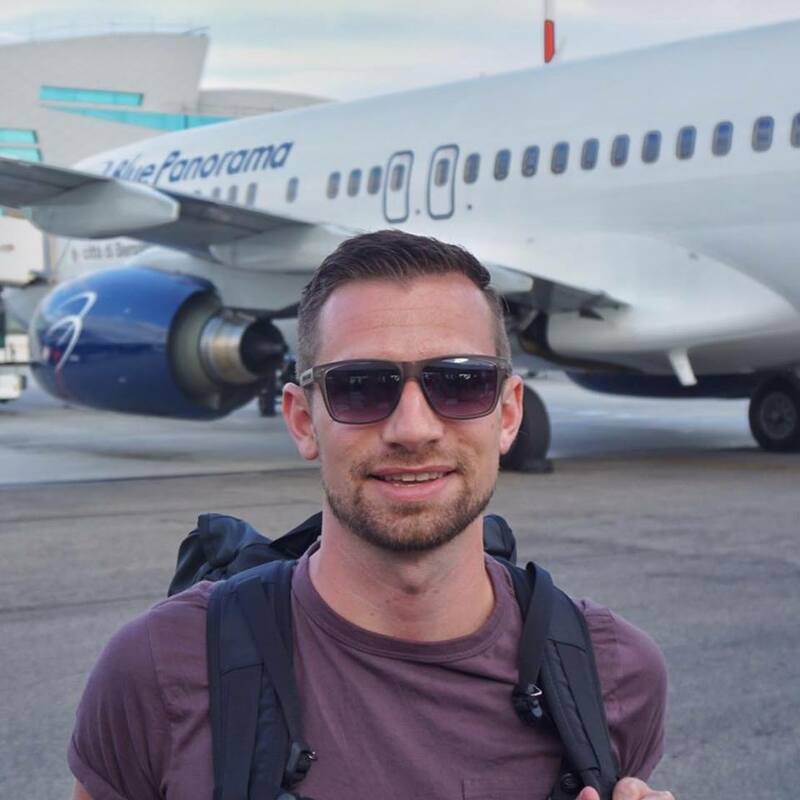 As OneWorld Sapphire, I received FastTrack security line access which was rally efficient. There were only a handful of passengers in FastTrack security and the security agents were really friendly. After clearing security in Terminal 4, I caught the terminal rail to the Terminal 4S satellite terminal. Iberia, American Airlines, and other OneWorld carriers operate from this satellite terminal. The terminal then divides into two areas: Schengen and Non-Schengen flights. Pro-Tip: For those of you who are unfamiliar, Schengen flights refers to flights operating within the Schengen Area. The Schengen Area includes 26 European nations with a common visa policy. Border controls within the Schengen Area have eliminated or reduced border controls to expedite travel and commerce. 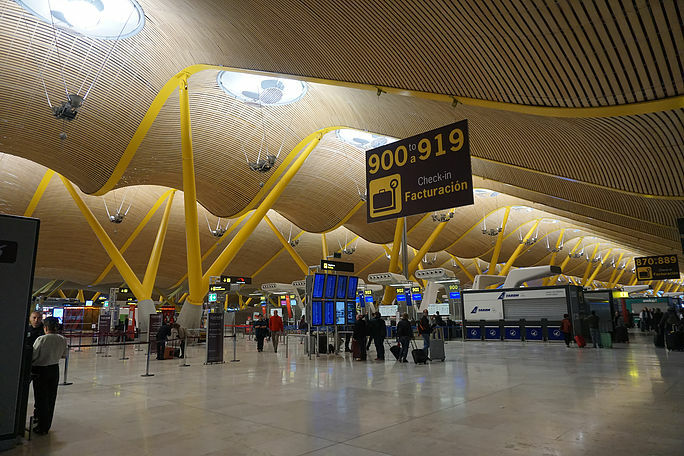 Once through immigration, I navigated the massive duty free shop and headed to the Iberia VIP Lounge Velázquez which oddly, has its entrance in the middle of the duty-free shop. I spent a nice 1.5 hours in the lounge before heading to my boarding gate which was quite far down the terminal. With lounge access as a OneWorld Sapphire, the Iberia lounge was the most comfortable part of my journey. I passed through another American Airlines agent who was checking passports and awaited boarding. First and Business Class boarded follow by elite flyers. Boarding was fairly easy as there were very few elite flyers on this flight. Our aircraft was one of American’s very dated Boeing 777-200s that is in serious need of a face-lift. After flying in Business Class on a new 777-300ER on the outbound, this was going to be a bit of contrast to say the least. 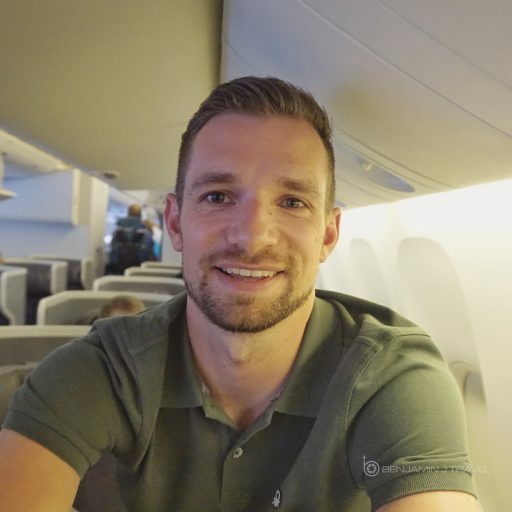 American is currently retrofitting their 777-200 fleet but the process is taking much longer than expected. 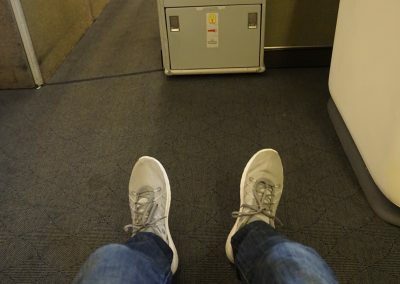 My favorite seats in Economy on these older 777-200s are in row 31. It’s the roomiest bulkhead row with DC power outlets. Only select rows in the main cabin have these power outlets on these older aircraft. 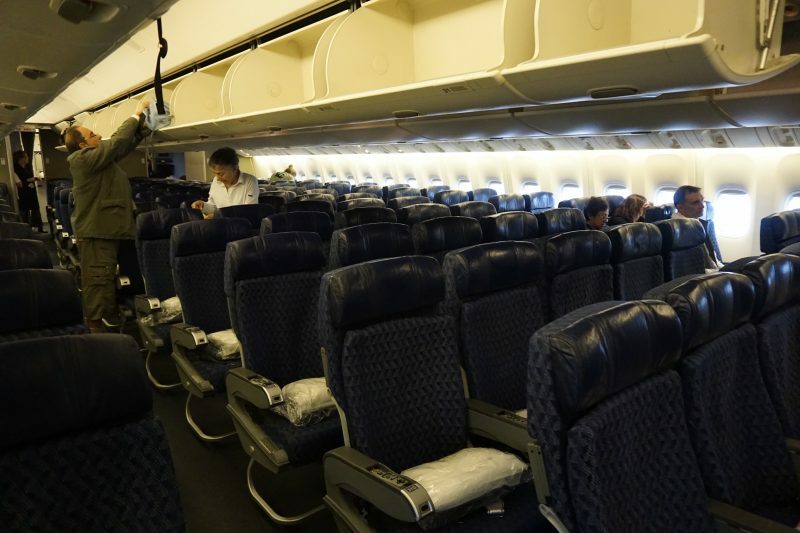 There is no “true” Main Cabin Extra seating on this version of the aircraft but select bulkhead rows are considered Main Cabin Extra due to additional legroom. We pushed back from the gate pretty close to on time From the start, he crew was certainly not a cheerful one. The crew was very senior and uninterested in providing good service. 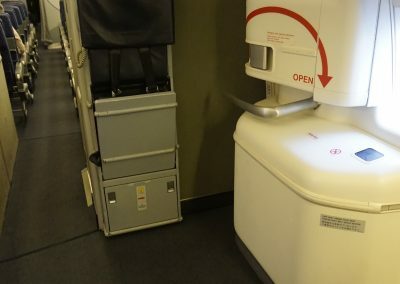 The crew would joke around with each other and laugh but as soon as a passenger would ask for something, they would act highly inconvenienced. The flight started a tad turbulent but I slipped into a nap for the first hour of the flight. Right as I awoke, beverage and lunch service was starting. It was the usual drinks and pretzels followed by lunch service. Options were teriyaki chicken or spaetzle pasta, the latter being the vegetarian option. I opted for the spaetzle which was heavy but not bad for an economy meal. I try not to sleep too much on westbound transatlantic flights but I took a solid 3 hour nap after lunch before waking up during the mid-flight snack. Chocolate ice cream was served along with beverages. 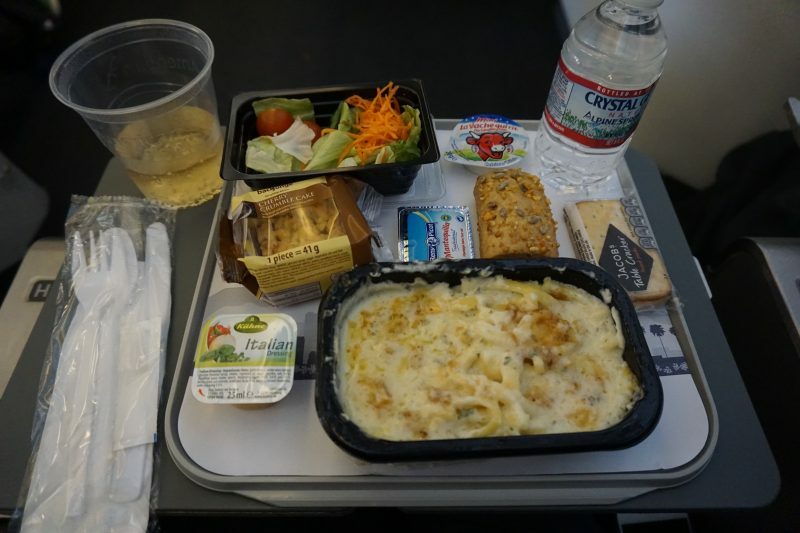 I have a recurrent dislike for the mid-flight sandwiches that AA usually serves in Economy on flights over 10 hours. I was happy they skipped serving those on this flight. The Flight Map, on both the overhead screens and the individual IFEs, was out of service. Plus, being in a bulkhead row, I did not have an accessible window to look out. It was like flying in the dark ages! Joking aside, I do like to keep up with the flight path and location throughout the flight so this was a bit disappointing. It’s also never happened to me before. 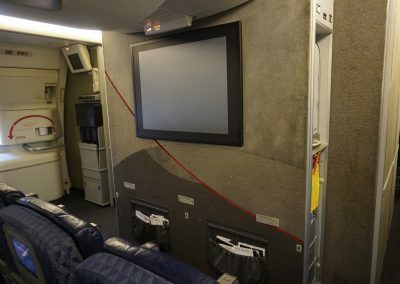 Also, if you haven’t flown one of these older 777s, be aware you can’t watch movies on demand. You have to start your movie in scheduled intervals which means you may have to wait 20 minutes or so for the next showing to start. It’s like TV without DVR! About an hour out of Dallas, the pre-landing meal was served along with beverages. This was more a warmed snack that a meal. It was a spinach and cheese wrap and a small sponge cake. It actually wasn’t bad at all! After roughly 11 hours in the air, we touched down in Dallas. And after a very long taxi, we deplaned at Terminal D. Customs was super-fast thanks to Global Entry even though there were several international flights arriving at the same time. While I’m accused of being an American Airlines defender, I do know their shortfalls and the old 777s is definitely of them. I would have to say this was one of the least pleasant long haul American flights that I’ve had in a long time. 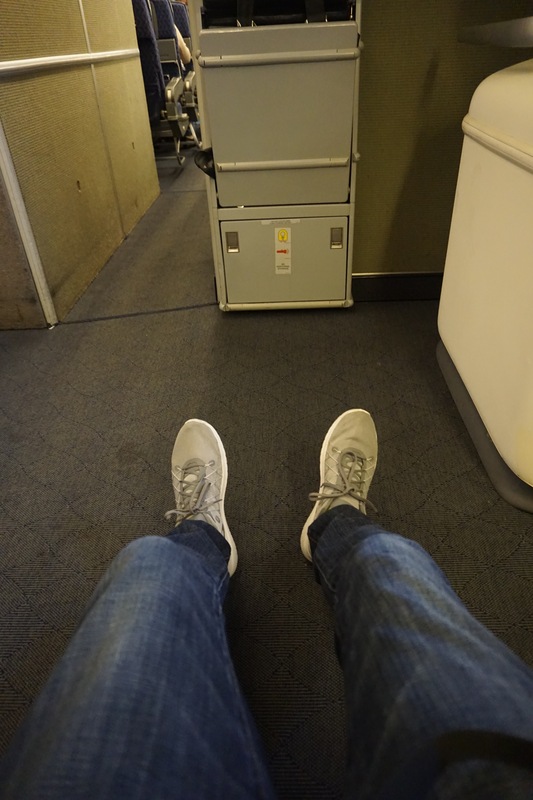 And it’s not just the old plane…..or being in Economy. 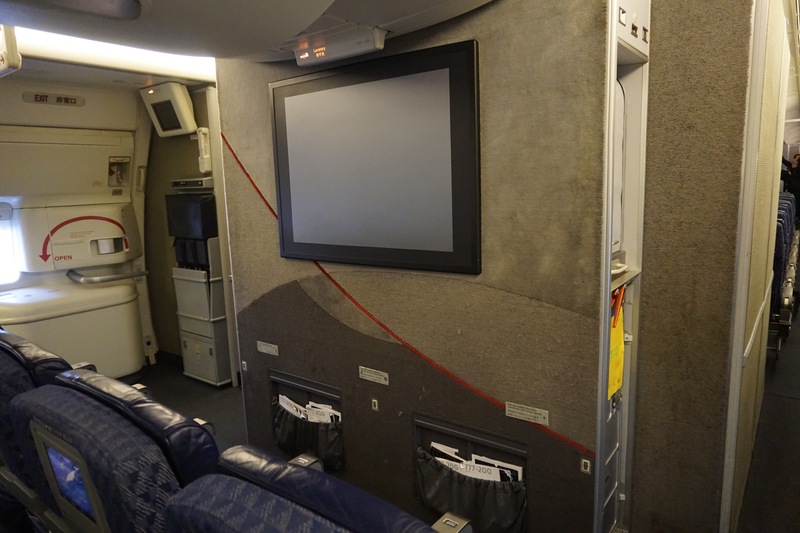 The surly crew and the sub-par IFE helped add insult to injury on this tired 777.